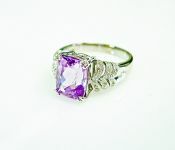 Discover our Selection of Antique Kunzite Rings, Estate Kunzite Rings, Vintage Kunzite Rings and Modern Kunzite Rings. For a Custom Kunzite Ring Design Click Here. A Lilac-Coloured Gemstone Discovered in 1902 By Tiffany & Co.'s Chief Jeweller. A beautiful vintage 14kt open wire work ring, circa 1950's, with 1 emerald cut light intense pink kunzite, est. 9.01ct. 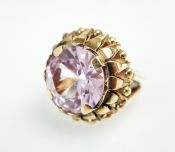 A beautiful vintage 18kt yellow gold ring, circa 1940's, with 1 round facetted cut light intense pink kunzite, est. 11.98ct.